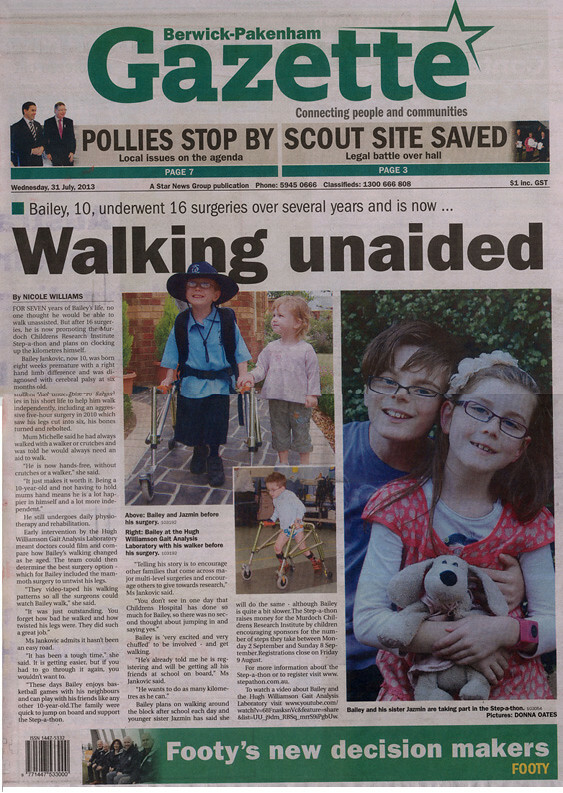 FOR SEVEN years of Bailey’s life, no one thought he would be able to walk unassisted. But after 16 surgeries, he is now promoting the Murdoch Childrens Research Institute Step-a-thon and plans on clocking up the kilometres himself. Bailey Jankovic, now 10, was born eight weeks premature with a right hand limb difference and was diagnosed with cerebral palsy at six months old. The Harkaway Primary School student has undergone 16 surgeries in his short life to help him walk independently, including an aggressive five-hour surgery in 2010 which saw his legs cut into six, his bones turned and rebolted. Mum Michelle said he had always walked with a walker or crutches and was told he would always need an aid to walk. Ms Jankovic admits it hasn’t been an easy road. “It has been a tough time,” she said. “It is getting easier, but if you had to go through it again, you wouldn’t want to. “These days Bailey enjoys basketball games with his neighbours and can play with his friends like any other 10-year-old.The family were quick to jump on board and support the Step-a-thon. Bailey is ’very excited and very chuffed’ to be involved – and get walking. Bailey plans on walking around the block after school each day and younger sister Jazmin has said she will do the same – although Bailey is quite a bit slower.The Step-a-thon raises money for the Murdoch Childrens Research Institute by children encouraging sponsors for the number of steps they take between Monday 2 September and Sunday 8 September.Registrations close on Friday 9 August. For more information about the Step-a-thon or to register visit www.stepathon.com.au.